Herzog was a journalist, playwright, academic, and member of the then illegal Brazilian Communist Party (PCB). Because of his alleged activism, agents of the Brazilian Army, representatives of the military dictatorship in Brazil that had been in power since the coup of 1964, had summoned him for questioning about his relationship to the PCB. On the morning of the 25th October 1975, the day after his summons, Herzog turned himself into the Department of Information Operations - Center for Internal Defense Operations (DOI-Codi). Based on the testimony of others held there, at the same time, his interrogators subjected him to harsh beatings and gruesome torture. Before the end of the day, Herzog was dead; his body found hung by his own belt strap from the bars of his cell. Dr Harry Shibata, who signed the death certificate, stated that the official cause of death was suicide. There were few in Brazil accepted this statement. On 31st October that year, The New York Times included the following statement in an editorial it ran: “If we accept the absurd hypothesis that the newsman [Herzog] committed suicide we must also know why he did it. The suicide is not the end of the Herzog case”. As early as November 1980 the doctor that had signed the death certificate asserting Herzog had taken his own life admitted that he had neither performed an autopsy nor seen the body. Despite that, it was a further 32 years before his family was to receive a new death certificate; one that, according to state newspaper Folha de S. Paulo, suggested his death was “due to torture at the facilities of DOI-Codi in the 2nd Army in São Paulo”. There is very little written in English about Vladimir (Vlado) Herzog. As a child, in the early 1940s, his family had fled to Brazil from Croatia; escaping the persecution of Jewish families, like theirs, as the atrocities of the Nazis became ever more apparent. He graduated with a degree in Philosophy from the University of Sao Paulo in 1959, going on to have an illustrious career as a journalist both in newspapers and later, as editor-in-chief, also in television. His death, alongside with that union leader Manoel Fiel Filho who died in similar circumstances just a few months after Herzog, resulted in a national and international outcry against the repressive military regime. In the early 1970s, he became increasingly involved with the civil resistance movement against the military dictatorship. It is around this time he became a member of the outlawed PCB. Within the country, there was public protest, with the actions of his fellow academics and students from the University of São Paulo bringing the work of the university to a halt. Herzog’s memorial service, held against the orders of the military regime at São Paulo cathedral, was officiated by Dom Paulo Evaristo Arns (The Catholic Archbishop of Brazil) Henry Sobel (The chief rabbi of São Paulo) and Jamie Wright (a Presbyterian minister). Despite the repressive regime’s power, the surge in public dissent was immense. The French philosopher Michel Foucault, who was on a lecture tour of Brazil at the time and attended the funeral service, suggested the crowd was so large the police present did not know how to respond. The reaction to the claim that Herzog had committed suicide was felt in many quarters of Brazilian society and culture. Allusions to the events surrounding his death soon formed part of the work of cultural activist within the country. Brazilian conceptual artist Cildo Meireles incorporated Herzog’s death in his interventionist project Insertions Into ideological Circuits. As part of the bank note project, which formed an element of that work, Mireles created credible looking fake bank notes, in the form of zero or non-existent denominations, which would incorporate a political message. The military coup that took place on 31st March 1964 deposed the constitutional government of João Goulart. Following a period of political and economic instability, Goulart had endeavoured to introduce a number of social reforms intended to address substantial inequalities within Brazilian society. This troubled many in the business community, those in mainstream media, landowners, members of the affluent middle-class and conservative elements within the Roman Catholic Church in Brazil. 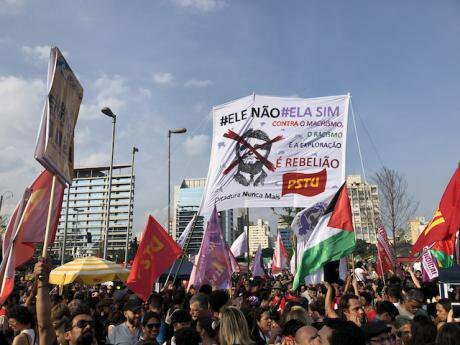 A growing tide of uncertainty lead many bourgeois Brazilians to feel concerned about the political direction being taken by what they viewed as their country. The United States, during a period where relations between the Soviet Union and the West were at some of the most chilling of the Cold War, saw such moves as an encroachment of Soviet style communism close to its own borders. Many in the American news media produced editorials that suggested they regarded the coup as a democratising force within the region. Foreign businesses also perceived the establishment of military rule as bringing stability to what they took to be a troubled nation. Investment form multinationals began to come into the country, with a short-lived bubble where the economy grew and employment increased. A broad public sense, especially amongst many in the wealthier, more social advantaged, classes, that law and order had returned to the nation, began to emerge. However, this was built on the dictatorships staunch repression and persecution of dissent, through coercion and the use of torture. Support from Ford and General Motors, amongst others, was used to invest in establishing the military’s Operaçāo Bandeirantes (OBAN: aka Operation Pioneer), ostensibly to ensure stability; in actuality it coordinated the army’s endeavours to repress what it took to be subversive elements within Brazilian society. Soon after the coup, with the military in control, the media felt the brunt of the regimes rule through its intimidation of journalists and the censoring of stories exposing the excesses of the military junta. Repression of news reporting, and censorship of what and how it could disseminate the news, had a sudden and profound impact on journalistic freedom. Brazilian historian and sociologist Clovis Moura wrote in 1979 “…it was difficult to speak about almost anything of importance”, continuing he says “(a) climate of cultural terror gradually accumulated; at any time, anyone might be accused, tortured, or assassinated”. It was in that context that Vlado Herzog had been summoned by the DOI-Codi to account for his connection to the PCB. Herzog’s death as a result of the torture tacitly meted out by a far right (military) dictatorship took place a little over 43 years ago. What has that to do with Brazil today? Just a few days after the anniversary of his death the Brazilian people elected Jair Bolsonaro to be the 38th President of Brazil. Bolsonaro’s campaign was very light on explicit economic policy. He has gone on record as saying he does not know much or care much about about economics. Instead, his rhetoric has concentrated on control of violent crime and overturning what has been portrayed as a corrupt left within Brazil’s political system. Whilst how you read the homicide statistics can be contested, many news media reports support a position that suggests the murder rate in Brazil is one of the highest in the South Americas. Politically his position has been bolstered by a mainstream broadcast and print media that has articulated a position which suggests it is the parties on the political left, such as the Workers Party (PT), that are the primary culprits when considering the corruption being brought into the spotlight by the ongoing Lava Jato (Operation Car Wash) inquiry. In one of his first statements, after the election, he has suggested the judge overseeing that inquiry (Sergio Moro) would be invited to join his cabinet; politicising further what is allegedly a neutral inquiry. Concomitant to this, there has been a significant increase in the number of web sites presenting populist right and far right positions that claim the more socially liberal measures of the leftist parties (such as LGBT+ rights; women’s rights, minority rights etc.) are a key contributor to the country’s current economic decline. Bolsonaro, it would seem, is speaking for a substantial number of Brazilians when he talks positively about the security felt by many during the years of military rule, referencing the prosperity it seemed to provide during its early years and downplaying the repression, persecution and economic polarisation of the period. Alongside all this, there has been a growth in the evangelical Christian right within Brazil. Traditionally a strong Roman Catholic country, albeit with hints of liberation theology during the later period of military rule, Brazil has seen a rapid rise of conservative evangelical groups. Bolsonaro, who professes a strong Christian faith, a Roman Catholic for many years he was recently baptised as a member of the Reign of God Pentecostal Church, has had significant support from many traditional and evangelical Christian groups. The government, constitutionally, is ostensibly secular. However, the growth of the evangelical right in Brazil has also seen more members of parliament articulating their politics as fundamentally connected to their commitment to a biblical literalism and Christian conservativism. This has brought to the fore an agenda that is seriously challenging hard-won freedoms for women, indigenous minorities communities, and the LBGT+ community. Bolsonaro has been quite public in his support for such reactionary views. He is on record as expressing ideas that would undermine those freedoms, articulating them in language that many take to be obscene and offensiveness. His sentiments have included suggesting a female member of the Brazilian parliament was too ugly to be raped, that he would rather that his son died in a horrible accident than come out as gay, or that his children are too well educated to bring home a member of an indigenous group as a prospective partner. His praise for the stability and security the former military dictatorship is supposed to have offered, has led him to suggest he would form a cabinet principally composed of military and ex-military personnel. Both Bolsonaro and his Vice-President Antônio Mourão are ex-military. The situation is unnervingly resonant with that of 1964. For those of us with friends and associates in Brazil, who care passionately about the victories for human rights that have been achieved in that country, and who feel that democracy as a participatory practice is being eroded, globally, see this turn to the far right in Brazil as profoundly troubling. Whilst is without question that Bolsonaro has been democratically elected, so have others who have gone on to form authoritarian and repressive regimes. Despite his election, the Ele Não (‘not him’) movement that sprang up to oppose his presidential campaign continues. Initially a women’s movement that grew out of Ludmilla Teixeira’s Facebook group “Women United Against Bolsonaro”, it now draws support from diverse quarters from around the world. As people who care about democracy, we have a responsibility to raise our voice along with those who speak out for human rights. Ludmilla’s original page, which grew to have 2.8 million supporters, was hacked by Bolsonaro supports during the early stages of the first round of the presidential campaign; changing its name to “Women United With Bolsonaro”. Ele Não still has a strong presence on the web and in a nice twist on the original hack – a Wikipedia search for the group lead the browser straight to Bolsonaro’ s entry. As people who care about democracy, we have a responsibility to raise our voice along with those who speak out for human rights. To work with others to be a voice for those that may become silenced, lest the rumblings of repression and persecution begin to be heard once more.